Lots going on in the world of your old pal. Writing up a storm on multiple fronts: short stuff, long stuff, and in-between. 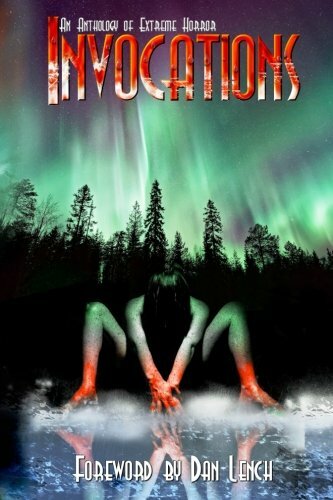 For example, my story ‘Let’s Go See the Honeyman‘ was just published in the Invocations anthology by Great Old Ones Publishing. You should all probably go out and buy a copy. Or two. Yes. Buy two copies. I perked up from my slice of pizza at that phrase, demanding a pen and something to write on. Scribbling furiously, I wrote down the seeds of what would become this story on our copy of the receipt, a receipt that I still have to this day; it lives in a place of honor in my Idea Notebook. And that is where the story stayed for a few years. I had attempted an outline of it at a few points in time over the years since that day, none of which passed the smell test. The story that is in this anthology is vastly different from the one I conceived that fateful Autumn day in Flatbread, much better, if I do say so myself. What is it about? What does that elderly honeyman do atop that lonesome hill? Will the unsuspecting couple be lucky enough to survive him and his honey? Probably not. This is ME we’re talking about. If you’d like to pick up a copy, it is available on Amazon or in my Short Stories page.